In less than 72 hours Take 6 will commence on a world tour in support of their latest Warners/Reprise release, Beautiful World, and bass vocalist Alvin Chea has the jitters. "I haven't been so nervous before a show in years and years," he says. "When we get onstage in Japan on Monday, we'll be entering a whole new territory." What could so unnerve a vertan pop/R&B vocal group famed for its technically perfect a cappella performances? This time around, they'll be playing while they sing. The group has occasionally fleshed out its studio recordings with instruments, but they've usually appeared live accompanied by nothing more than a piano. For years the guys have been talking about playing instruments onstage. Now all bluffs have been called. "Actually," says Chea, "we originally got together as instrumentalists, but we became an a cappella group out of our common love for that old Southern gospel quartet style. For years the guys have been talking about playing instruments onstage. now all bluffs have been called. Dave Thomas is playing guitar and bass, Joel Kibble is playing guitar, and the rest of us are on keyboards." 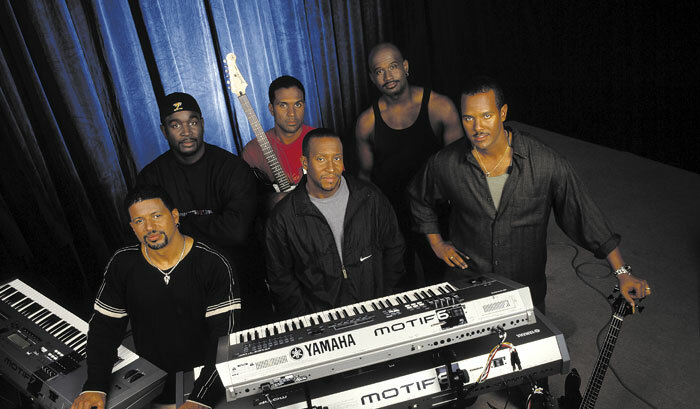 Take 6 will have four Yamaha Motif music production synthesizers onstage. "We all gravitated toward the Motifs, because they are so state-of-the-art," says Chea. "They have samplers, sequencers and monster polyphony. The operating system is very user-friendly, with lots of shortcuts, like the ability to save favorite patches on a special page. We simply drop all the sounds we need for a show into a single panel. For an a cappella group that has finally decided to perform with instruments, we really hit a homerun with the Motif system." According to Chea, the Motifs have not only helped Take 6 reproduce their new music onstage but have suggested whole new musical directions: "There are so many wonderful Motif sounds, " he enthuses. "Someone would stumble across a great patch during a break in rehearsal, and everyone's head would snap up at the same time. Suddenly we'd all be off down a whole new road inspired by that timbre." Another plus is the fact that the Motifs excel as on-the-road workstations. "You can have everything you need to make tracks in your hotel room," says Chea. One of Chea's vocal trademarks is mimicking bass instrumentalists. But now that he's playing onstage, does he find that his vocal style influences his instrumental approach? "Definitely," he says. "As a bass singer, I probably have a tendency to think more melodically than rhythmically relative to some bass players. When I play, I remind myself not to add too much. As singers, we've all learned that there's as much music in the silences as in the notes, and we all try to remember not to overplay." Chea says he rarely doubles his vocal lines on the keyboard: "Most often I sing walking bass lines while playing pads. The two parts can be very different. There are all sorts of interweaving, contrapuntal lines. Sometimes I'm even harmonizing with myself in two different rhythms. It definitely involves syncing up two different parts of my brain. It's the first time in a long time that my head has been swimming after a rehearsal." Despite the challenges, Chea is confident that Take 6's new approach will click with audiences. "Our fans may sit there shocked at first. But we made sure to include a lot of a cappella breakdowns within the songs, so there's a strong tension and release to the arrangements. We're finding the happy medium between six-part vocals and instrumentation. For example, we might just add drums and percussion, or perhaps augment my sung bass line with a complimentary instrumental bass sound. And sometimes it's full-out, heavy-handed, big-time tracks that are just slammin'.